Salmon can be found in Osoyoos Lake, though there are not as many as there used to be for a variety of reasons including water quality, temperature, and human activities (see below). They are known as Sockeye salmon and they use the lake as part of their migration route to and from the Pacific Ocean via the Columbia River. Okanagan sockeye are considered at risk and face extirpation (local extinction) within the next 20 years if immediate action is not taken to stabilize and rebuild the population. The Okanagan River salmon run is one of only two remaining runs in the entire Columbia River system, the other originating in Wenatchee Lake. Salmon are one of only two freshwater fish to migrate (the other being the coastal cutthroat trout, a cousin of the rainbow trout). The migration of salmon is considered one of the great ‘miracles of nature’ and is the source of much fascination and interest the world over. Scientists continue to study and attempt to answer many questions: where do they go? Why do they feel this need to migrate at all? And how are they able to find their way back up the river to the exact place where they were born? The sockeye salmon is greenish-blue with fine black specklings on back. Spawning males have pale green heads, dark jaws, pale undersides and bright red bodies. They grow up to 33 inches in length and weigh up to 15 pounds. Kokanee, though similar in appearance to the sockeye, is a subspecies of the sockeye salmon. They are ‘landlocked’ (do not migrate to the sea) and they spawn along the shores and tributaries of Okanagan Lake, Wood Lake and Kalamalka Lake. They have only been seen occasionally in Osoyoos Lake. Sockeye salmon is a culturally and economically important resource to commercial fishermen throughout Alaska, British Columbia, Washington and Oregon. They rank first in economic value to the BC fishing industry. They are also an important subsistence fish and a valuable recreational resource. Salmon of all kinds are important to scientists and environmentalists because they are in the middle of the food chain and a good indicator of the general health of a river or lake’s ecosystem. They are crucial to the culture and history of First Nations people. It’s a difficult journey from egg to spawning adult. Only about two percent of all salmon hatched will live to adulthood. 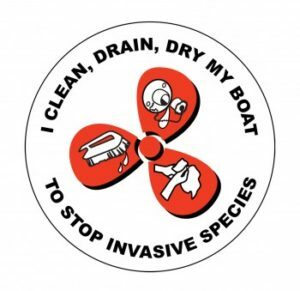 There are many natural predators of salmon – birds, fish, marine mammals, and disease. Human-made obstacles include harvesting, river blockages, pollution, and poor habitat management. The Okanagan run eggs are laid in shallow, well-shaded gravel along a seven kilometre stretch of the Okanagan River just south of McIntyre Bluff. Long ago, they used to hatch much further up and down the river and along the shores of all the lakes and stream tributaries of the valley, but the installation of McIntyre Dam together with the channelisation of the river in the 1950s took away most of their spawning habitat. The female salmon chooses a site, digs a nest (redd) with her tail, then deposits eggs. One or more males fertilize the eggs. Each nest contains between 500 and 1,200 eggs. About 20 out of 100 eggs laid may survive to become fry. In late winter, the eggs hatch. Tiny alevins nestled in gravel live on the nutritious yolk “pot belly” on their undersides. While they have a yolk sac, alevins don’t need to eat. Once the yolk sac is gone, they must find food quickly or they will starve. When juvenile salmon or fry emerge from the redd, they must find food immediately. Most feed on tiny planktonic (drifting) organisms and a variety of insects. After a few weeks they begin to travel downstream, negotiating several drop structures built when the river was channelized, and arrive in Osoyoos Lake. Here they remain for 1 – 3 years, surviving in a narrow layer of deep water in the northern section of the lake. Unfortunately, this layer is the only section of water that salmon can thrive in since the layer above is too warm, partly due to the destruction of cool shade-giving vegetation along the lakeshore. The layer below contains too little oxygen for them to breathe, due in part to increased pollution in the lake. Scientists have found the middle layer of this ‘sandwich’ to be decreasing in size over the past few years, forcing the salmon into a tighter and tighter space to survive. After this they migrate down the Okanagan River, through Washington State where it joins up with the Columbia River and finally reaching the Pacific Ocean near Portland, Oregon, nearly 1,000 km away. Saltwater meets freshwater in estuaries, making a mix called “brackish” water. When fry enter estuaries, they begin to adapt to saltwater a process called “smoltification.” This major change causes young salmon to become less active and more vulnerable to predators such as birds and larger fish. To survive, young salmon must find places to hide and feed. Ocean-bound young salmon may spend days or months in estuaries and nearshore waters as they adjust to saltwater and grow, getting ready for their ocean journey. Sockeye may feed and grow in the ocean from one to four years. Most head north, following the coast. They may travel thousands of miles, heading into the Gulf of Alaska and points beyond. While at sea, salmon must evade predators such as larger fish, orca whales, dolphins, sea lions, and seals. After their years at sea the salmon return to swim back up the river to the exact place where they originally hatched out. This migration occurs between July and October and takes about 33 days. The fish cover an average of 30 km per day. They have to negotiate numerous dams, fish ladders, high water temperatures, low water levels, lack of shade, and of course various forms of pollution. What causes adult salmon to move from ocean feeding grounds to their birthplace is not fully understood. Some scientists believe that salmon use the sun, moon and stars to navigate their way back: others suggest they can identify tiny particles of the characteristic smell of their own river. When sockeye salmon enter the river to spawn, they stop eating and rely entirely on their body fat for sustenance. They lose their shiny, silvery colors; males may take on bright red body colors, a hooked nose, and large teeth. Females may develop darker colors. Most sockeye die within one week of spawning. The dead salmon are not wasted. Their decomposing bodies add important nutrients to the water. Dead and decaying salmon also provide food for a wide range of wildlife. In Osoyoos, you can see the salmon at their best in late October as they journey upstream. The bridges on Road #18 (above) and #22 north of town are good viewing locations. What problems are sockeye salmon facing? Channelization and straightening of the Okanagan River in the 1950s which removed over 90% of their natural spawning grounds. Increased water temperatures in Osoyoos Lake and the Okanagan River: salmon need cool water (17 degrees or lower) to thrive. Less oxygen in the deeper levels of Osoyoos Lake, where salmon reside for up to two years before migrating to the ocean. Introduction of mysis shrimp to Okanagan Lake in the 1960s, which compete with salmon fry for food. Development of land along the shores of Osoyoos Lake and the removal of plants, rocks, gravel, trees etc which used to provide essential feeding and spawning areas. These natural features are being replaced with turf grass and concrete walls which do not provide shade and are contributing to the increase in water temperature. A succession of dams along Okanagan River and Columbia River which impede their migration progress. Most dams now have fish passages, but some have only recently been built and some fish are still unable to negotiate the ladders. Deterioration in water quality due to human activity: fish need clean water to survive and spawn. Inadequate water flows in rivers and streams due to water diversions for irrigation, and the impoundment of water for power generation. Some returning salmon even find they are unable to spawn because their streams have dried up completely. Increasing the salmon population is being addressed by several different government and non-government groups, such as Ministry of Environment, Department of Fisheries & Oceans, Pacific Fisheries Research Conservation Council and others. In the Okanagan, the most active is the Okanagan Nations Alliance, a stewardship group for the management and protection of native tribal lands and its natural resources. They have initiated a multi-year project to reintroduce sockeye back into their former spawning and living grounds that have been closed to them for the last several decades. In 2004, they released 350,000 sockeye fry into the Okanagan River upstream of Skaha Lake. In May, 2005 they released a further 1.1 million salmon fry into the Okanagan River near Penticton. The ONA is using McIntyre Dam as a study location for tagging, counting, checking eggs etc of the sockeye. The studies are ongoing, although early results on returning salmon appear promising. 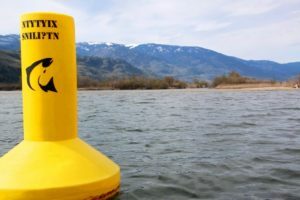 Research is also being carried out by various other groups in Washington state at Wells Dam, Zosel Dam at the south end of Osoyoos Lake (where an underwater video camera is being used), and many other locations.